PR pros, take a lunch break! Wouldn’t it be nice to eat without getting mayo all over your keyboard? We’re all guilty of not talking a lunch break and eating over our laptops at times. Even if we do step out for a “break,” we’re usually fiddling with our phones, checking emails, etc. Many PR professionals eat lunch at their desks. “Sixty-nine percent of PR professionals eat lunch at their desk rather than joining that chatty klatch heading out to a nearby deli, according to the PR Daily Salary and Job Satisfaction Survey” (PR Daily) With the year coming to a close, PR pros are especially busy planning for 2014, but it’s not an excuse to skip lunch. Food=fuel. If you take some time for lunch, you’ll have more energy to tackle the next project. If you step away from your desk, you’ll be able to clear your mind and take a break from the digital world. Refuel, but not with coffee. Try an apple or fruit instead. Take your dog for a stroll if you’re nearby or work from home. Take some time to breathe in the fresh air to help relax your mind. Pamper yourself occasionally. Why not schedule a massage? 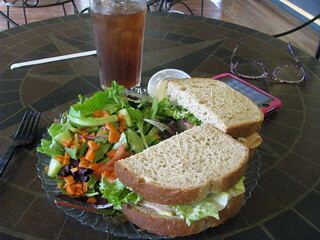 This entry was posted in pr, workplace wellness and tagged health, lunch, pr by elysealtiere. Bookmark the permalink.